Windows 8 installs with .NET 4.5. 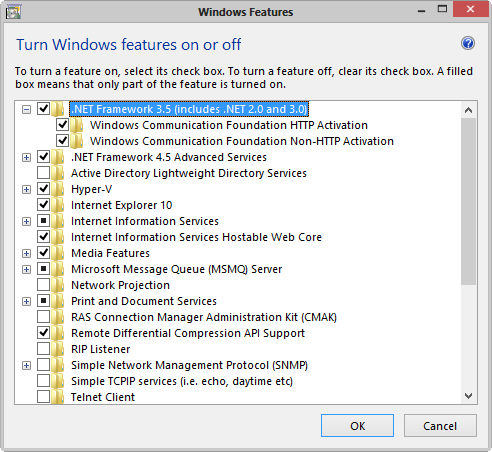 A default installation of Windows 8 doesn't seem to include .NET 3.0 or 3.5, although .NET 2.0 does seem to be available by default (presumably because Windows has app dependencies on that). I ran into some pretty nasty compatibility issues regarding .NET 3.5 which I'll describe in this post. I'll preface this by saying that depending on how you install Windows 8 you may not run into these issues. In fact, it's probably a special case, but one that might be common with developer folks reading my blog. Specifically it's the install order that screwed things up for me - installing Visual Studio before explicitly installing .NET 3.5 from Windows Features - in particular. If you install Visual Studio 2010 I highly recommend you install .NET 3.5 from Windows features BEFORE you install Visual Studio 2010 and save yourself the trouble I went through. So when I installed Windows 8, and then looked at the Windows Features to install after the fact in the Windows Feature dialog, I thought - .NET 3.5 - who needs it. I'd be happy to not have to install .NET 3.5, but unfortunately I found out quite a while after initial installation that one of my applications/tools (DevExpress's awesome CodeRush) depends on it and won't install without it. And that *should* do the trick. If you do this before you install other apps that require .NET 3.5 and install a non-SP1 one version of it, you are going to have no problems. So naturally I thought the CodeRush installer is a little whacky. where I found that .NET 3.5 SP1 was installed. This is the 64 bit key which looks all correct. Notice that the service pack number is set to 0, rather than 1 (which it was for the 64 bit install), which is what the installer requires. So to summarize: the 64 bit version is installed with SP1, the 32 bit version is not. Uhm, Ok… thanks for that! Easy to fix, you say - just install SP1. Nope, not so easy because the standalone installer doesn't work on Windows 8. I can't get either .NET 3.5 installer or the SP 1 installer to even launch. They simply start and hang (or exit immediately) without messages. I also tried to get Windows to update .NET 3.5 by checking for Windows Updates, which should pick up on the dated version of .NET 3.5 and pull down SP1, but that's also no go. Check for Updates doesn't bring down any updates for me yet. I'm sure at some random point in the future Windows will deem it necessary to update .NET 3.5 to SP1, but at this point it's not letting me coerce it to do it explicitly. I figured enabling the .NET 3.5 Windows Features would do the trick. But still no go. Now I suspect Visual Studio installed the 32 bit version of .NET 3.5 on my machine and Windows Features detected the previous install and didn't reinstall it. This left the 32 bit install at least with no SP1 installed. and voila, I now have a proper installation of .NET 3.5. I tried this before but without the reboot step in between which did not work. Make sure you reboot between uninstalling and reinstalling .NET 3.5! The above fixed me right up, but in looking for a solution it seems that a lot of people are also having problems with .NET 3.5 installing properly from the Windows Features dialog. The problem there is that the feature wasn't properly loading from the installer disks or not downloading the proper components for updates. It turns out you can explicitly install Windows features using the DISM tool in Windows. You can try this without the /Source flag first - which uses the hidden Windows installer files if you kept those. Otherwise insert the DVD or ISO and point at the path \sources\sxs path where the installer lives. This also gives you a little more information if something does go wrong. I don't have this problem until now. But I cannot access the Windows Features dialog, it always asks me to enter or buy a product key on both machines. One machine is running Windows 8 Pro 32 Bit German, the other one Windows 8 Pro 64 Bit English. Both with valid Dreamspark Premium licenses. Entering the product key used during installation does not work here. Are there any limitation with the Dreamspark Premium licenses? I don't think Visual Studio 2010 installs .NET Framework 3.5. It ships with .NET Framework 4. @Lex - *VS 2010* does install .NET 3.5 (and 4). VS 2012 installs .NET 4.5. I tried your solution and checked registry after un- and re-install asp.net 3.5. I found the SP on 32 bit sets to 1. However, on IIS 8's Application Pool, still can't see the .NET 3.5. I tried to install asp.net manually but it seems the installation .exe does not work at all. I was wondering if you have the same problem, on windows 8 64 bit I can't reference a FoxPro COM object anymore, any ole object .dll I create isn't able to be referenced by VS2010 anymore. I think it has something to do with the 3.5 32 bit version of .net. I checked the things you described above but mine was installed correct as I can conclude from your screenshots. But it looks like VS2010 doesn't use the 32 bit reference creator to build a wrapper around my FoxPro dll. Have you any sugestions where to look? Do you have the same problem? @Smart - because some apps explicitly REQUIRE .NET 3.5. In this particular case it's the CodeRush tools - .NET 4.0 didn't allow to install the tools. Basically apps can request a specific version of the .NET runtime via Config file or manifest settings. @Eric - you need to make sure your .NET apps are compiled explicitly for x86. The default is Any CPU I believe and that means on a 64 bit app it'll run in 64bit. A 64bit app can't call a 32 bit COM component. As a workaround if the COM object is a DLL you might be able to work around this by using COM+. I have installed windows 8 x64, but I can't install .net framework 3.5 from installation DVD, how can I do that? I tried command prompt and it didn't work. Create or modify the app.config file, and set the supportedRuntime element to 4.5. This will cause the 4.0 CLR (which will use the 4.5 framework) to load the assembly, and does not require any change (ie. recompile) to the executable itself. You might also want to include: 2.0.50727 for when CLR 4.0 is not available.